The morning of March 22, 1882 dawned crisp and clear as a grief-stricken woman followed a slow procession from the London Zoological Gardens to St. Katherine’s Dock. She carried a mug of beer as a small goodbye token for the gentle giant who would depart that day. After nearly seventeen years in London, Jumbo the elephant was beginning his trans-Atlantic journey to join Barnum & Bailey’s famous show. Jumbo enjoyed his beer, and though it was a little bit of a struggle (likely because he’d heard that P.T. 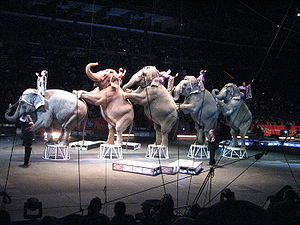 Barnum had a strict policy against inebriated elephants), allowed himself to be crated and taken to a boat from which he would later be placed onto the large ocean vessel, Assyrian Monarch. Thousands of fans waved and cheered him, causing Jumbo to become agitated, shifting his weight back and forth, the fortunately heavily ballasted boat swaying right along with him. 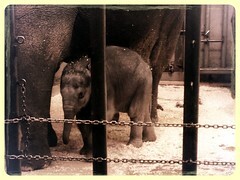 This marked the end of a battle for the English public which had been outraged over the Zoo’s sale of Jumbo to P.T. Barnum. The February announcement of the sale was followed by a huge surge in visitors to the zoo, people (with their eyes popping out) flocking to see one more time, the nearly 12-foot tall African elephant that had given gentle rides to countless English children over the years. A letter writing campaign both to the zoo and to Queen Victoria, whose own children had been passengers on the elephant’s back, began almost immediately with irate English citizens demanding that Jumbo remain in London. Jumbo’s biggest fans began a fund to try to save Jumbo from his fate as a circus attraction and soon launched a lawsuit against the sale claiming that it contradicted the Zoo’s bylaws. 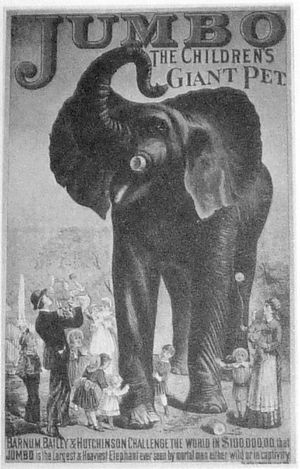 Of course he wasn’t quite that big (though I think you’ve got to admire the salesmanship, examination of the elephant’s skeleton reveal that he was actually 10’9”), but Jumbo proved even more popular on tour in America than he had in London, his name (again thanks to Barnum’s masterful promotion) even seeping into the English language as a descriptor for all kinds of large things (jumbo jets, jumbo-drinks, and jumbo-size packages of disposable diapers to name just a few). Jumbo captured the public’s interest for a couple reasons. Obviously, he was well-promoted (I imagine if Jumbo were alive today he’d probably have his own twitter account: “ If one more kid tries to feed me a peanut I swear I will step on his foot #elephantskeepingitreal”). But that’s not all there was to it, because Jumbo was not the first elephant to be shipped to the US and he was certainly not the first to make a lot of money for his owner. People loved elephants. And we still do. Several weeks ago, my family and I visited the Oregon Zoo in Portland. We headed that way to view the annual Zoo Lights display, but we decided to go early. Actually, that sounds too casual. We rushed to get there in the early afternoon because on Friday, November 30, the zoo had welcomed a new baby Asian elephant who had finally been named (Lily) by public vote and was now on display for brief windows of time. Lily at the Oregon Zoo. So stinkin’ cute! Because captive elephant breeding programs are not widely successful (though the Oregon Zoo has been more successful than most), Lily’s birth was a big deal. We stood in line a long time to meet her and just before the docent let us in to see her, the keepers took mama and baby out to clean up a bit. That meant we got to enter the building in time to see Lily, a rambunctious 300-pound toddler, rush into the indoor enclosure to find fresh popcorn scattered between the glass from behind which we viewed her, and the bars that provided a walkway for keepers. Mama (named Rose-Tu) lumbered in after her baby and reached her trunk through the bars calmly sweeping up the popcorn and dropping it into her mouth. Lily mimicked her, though Rose-Tu was pretty deft at sweeping the popcorn away from her baby. Lily’s little trunk (actually much smaller in proportion to the rest of her than you find in adult elephants) wasn’t quite coordinated enough to grab any of the popcorn, though that certainly didn’t stop her from trying. I laughed (we all did) because not only was it just about the cutest thing you’d ever want to see, but, I think, because any of us who’d ever seen a human baby reaching and grabbing for something they shouldn’t have as Mom or Dad holds them close and keeps them out of trouble, recognized the actions we were watching. It was undeniable in that moment that this nearly 300 pound creature was, in fact, a baby, in need of protection. Lily has enjoyed her fair share of promotion just as Jumbo did, but I think we are drawn to elephants for more than just the fanfare (though I guess it is convenient that they come complete with their own trumpets). Our fascination, I think, stems from the fact that this giant among creatures is actually one of the most vulnerable animals on the planet and it needs our help if it is to survive both in the wild and in captivity. What’s more is that elephants, despite their size, are not overwhelmingly aggressive animals and, in fact, with caution, can establish lasting friendships with people (who they believe are people, no matter how small) and have been known on occasion to share their ice cream with small pigs. They also make very faithful babysitters, provided they stay away from the beer. I wonder just how much helium it takes to make an elephant float.